Minnesota Health Care Directive (Medical POA & Living Will), which allows a person to appoint an agent to represent him or her with health decision-making power and/or allows the user to provide end of life care instructions can be used to either appoint someone (Medical POA), provide instructions for care (Living Will), or both. As always, there is the unfortunate possibility that you will be hospitalized and unable to tell the doctors your preferences. That’s when it is useful to have this type of form in place. This form is governed by Chapter 145C of the Minnesota statutes. Durable Power of Attorney – This form is used in anticipation of the Principal becoming physically and/or mentally unable to make intelligent financial decisions for themselves. This form should be read in its entirety before any information is filled out. This document will contain specific information that should be understood by all involved parties. A copy may be found on this page using the buttons below the preview picture. Select the file type you prefer then open it or download it then open it. Locate the first blank space in the first sentence of this form. Make sure the Full Name of the Principal is presented here. The Principal must read and understand this first page and understand it in order to proceed. Find Part I directly below the Principal’s acknowledgment. 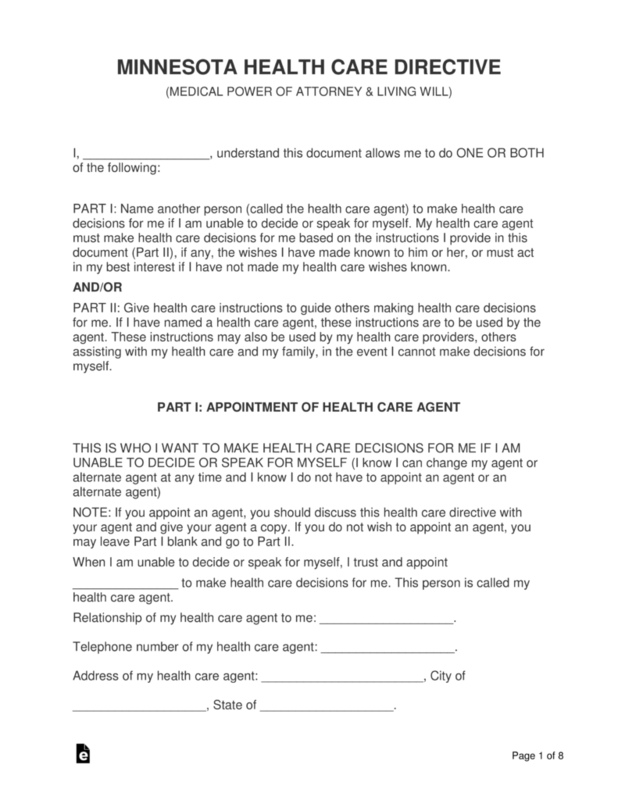 Use the first blank space, in the statement beginning with “When I am unable to…” to present the Full Name of the Health Care Agent the Principal is appointing with Power regarding his or her Health Care. The second blank space in this area will require a definition of the Health Care Agent’s relationship with the Principal entered. The third space, following the words “Telephone number of my health care agent,” must have a well-maintained Telephone Number where the Health Care Agent will be found. The last statement on this page, “Address of my health care agent…” provides three spaces so the Street Address, City, and State of the Health Care Agent may be clearly displayed. The top of the next page will have an “(Optional)” section. If a Principal has elected to appoint Power to an Alternate Health Care Agent, an individual to step in and assume power if the Primary Health Care Agent is unable to act as such, this area will allow for this information to be entered. If the Principal has elected an Alternate Health Care Agent, then enter the Full Name of this individual on the blank space preceding the words “to be my health care agent instead. 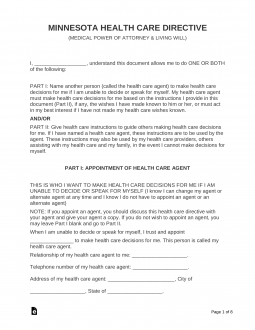 The next statement “Relationship of my health care agent…” will contain a blank space where the Title/Status/Relationship of the Alternate Health Care Agent to the Principal will be required. The next required piece of information will be the Alternate Health Care Agent’s Telephone Number. Enter this on the third blank space in this section. The Principal may choose to document the Decision Making Powers being granted to the Health Care Agent. The Powers being granted to the Health Care Agent will appear in a list below the sentence beginning with the words “This is what I want…” Each Item in this list (A through D) will define a specific power. If there are any subjects of Power on this list the Principal does not wish to grant one of these Authorities or Powers to the Principal, this may be reported on the blank lines below this section. These blank spaces may be used to limit or even restrict any of the listed powers. If this option is enacted, make sure to start the description of conditions, limitations, or restrictions with Item Letter concerned. The next set of blank lines provided have been provided so the Principal may elucidate upon the Rights or Powers being granted to the Health Care Agent. This may be concern provisions, conditions, limitations, restrictions, or extensions of or on the Powers being granted. The Second Part of this document (“Health Care Instructions”) may be filled out with the First Part or in lieu of the First Part. There will be several areas here to help define the Principal’s Instructions and Preferences if his or her Health Care Agent is called upon to make Health Care Decisions. Such decisions will likely be determined by this section if it is filled out. The next set of blank lines will require a report on when the Principal believes life is no longer living documented just below the statement “My beliefs about when life would be no longer worth living.” This section should concern the Principal’s quality of life vs required medical care (to live). The next area will begin with a short passage regarding providing some further instructions for some specific circumstances. Locate the statement beginning with “If I had a reasonable chance of recovery.” Here, use the blank spaces to give the Health Care Agent instructions on what sort of decisions should be made in the event the Principal is unable to speak but does have a decent chance to recover from the medical event he or she is suffering from. Next, locate the statement beginning with “If I were permanently unconscious…” then report on the Principal’s wishes if he or she were to be rendered physically and permanently unconscious (i.e. a coma) on the blank lines provided. The statement beginning with “If I were completely dependent on others…” will assume a situation where the Principal is completely incapable of caring for him or herself. That is, he or she cannot survive without day-to-day help. Report the Principal’s wishes in such a situation using the blank lines provided below this statement. The next sentence, starting with the words “In all circumstances, my doctors will try to keep me comfortable…,” requires specific Principal instructions on pain relief vs longevity and/or alertness. Document the Principal instructions to the Health Care Agent if he or she must receive medicine for pain relief. The final statement, “There are other things…” gives the opportunity to address any issues not previously discussed. Several blank lines have been supplied for this purpose. Next on the space following “Who I would like to be my doctor,” report the Identity of the Principal’s preferred Physician. On the space after the statement “Where I would like to live…” define where the Principal wishes to live if he or she must receive Medical Treatment at home. The next page will contain some items that become relevant upon the Principal’s Death. On the blank lines at the top of the Sixth Page, report where the Principal would prefer to die, any preferences the Principal wishes to occur when dying and/or circumstances the Principal wishes to avoid when dying. Next, enter any preferences the Principal has regarding making anatomical gifts, upon death, consisting of body parts, tissues, and/or organs on the blank lines provided. The blank lines below the words “Any other things” have been supplied so that any concerns the Principal has regarding his or her remains at death that have not been discussed may be documented. The Principal must sign his or her Name on the blank space labeled “My Signature.” On the adjacent line, labeled “Date Signed,” the Principal must enter the Date of Signature. Below this area, the Principal must enter his or her Birth Date on the line labeled “Date of Birth.” Finally, the Principal must also report his or her Street Address and City on the spaces following the words “Address” and “City of” (respectively). In some cases, the Principal may not be able to sign his or her Name. If so, then on the lines below the sentence starting with “If I cannot sign my name…” report the title of the individual signing this document on behalf of the Principal. Below this on the blank spaces labeled “Signature” and “Print Name,” the Signature Party must sign and print his or her Name. There are two options provided for the authenticating of this form’s signing. The Principal may either Notarize this signing or sign in the presence of two witnesses. The Principal must perform the signing using the method in Option 1 and/or Option 2. “Option 1: Notary Public” may only be filled out by the Notary who will provide the Notary Stamp. This entity will verify the Date and Parties Present before providing his or her Signature and Notarization. “Option 2: Two Witnesses” shall have two identical sections. Each section must be satisfied with a unique Witness present at the time of signing. The Witness must provide the Date using the first two blank spaces (Month, Day then, Year). If the Signature Witness is a health care provider administering care to the Principal, he or she must initial the blank space in item “(iv).” Then, below the Acknowledgment Statement, the Witness must provide his or her Signature, Signature Date, Birth Date, and Home Address on the blank spaces provided. Note: Two Witnesses are required for this option.